Squid Ink’s PZ Pilot Touch is a feature-rich printing system designed to print hi-resolution characters, razor sharp text, scannable bar codes, and great looking logos at 185 dpi. The PZ Pilot Touch offers more options for making your mark: oil-based systems for printing on porous surfaces like corrugated cases, or solvent-based systems for printing on non-porous products like plastics, metals and more. 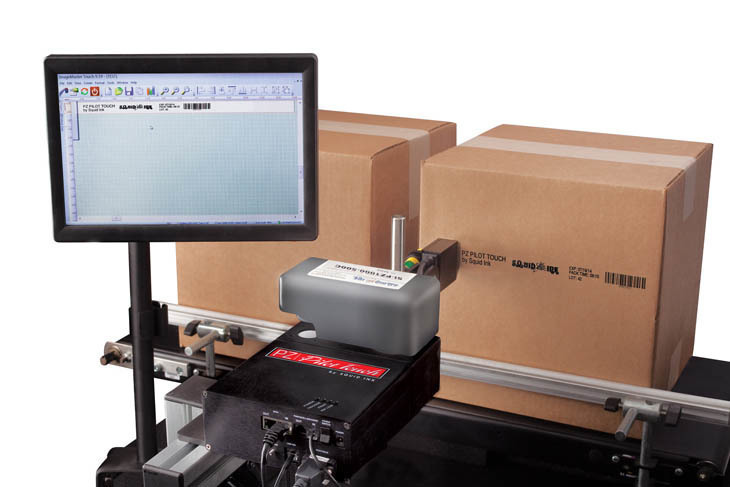 The PZ Pilot Touch is designed to work as an integral part of your day-to-day packaging operation. A simple, easy-touse 12.1” full color touchscreen controller with ImageMaster Touch software provides a quick and easy way to program, edit, and recall messages right at the production line. The PZ Pilot Touch comes with 8GB of memory, more than enough room to store all the messages your application requires. The PZ Pilot Touch is engineered inside and out for industrial strength operation. Heavy-duty cabinetry and printhead bracketry ensure continuous operation in the most abusive industrial environments. In addition, the PZ Pilot Touch is designed as a modular system. Quick and easy-to-install replacement printheads, circuit boards and ink system modules minimize downtime and service calls. A fix can be completed in less than 5 minutes.